On December 5, 2013, South African president Jacob Zuma addressed the people of that nation via television to make the official announcement that our brother Nelson Mandela had died at the age of 95. "Our nation has lost its greatest son. Our people have lost a father. Although we knew that this day would come, nothing can diminish our sense of a profound and enduring loss. His tireless struggle for freedom earned him the respect of the world. His humility, his compassion, and his humanity earned him their love. 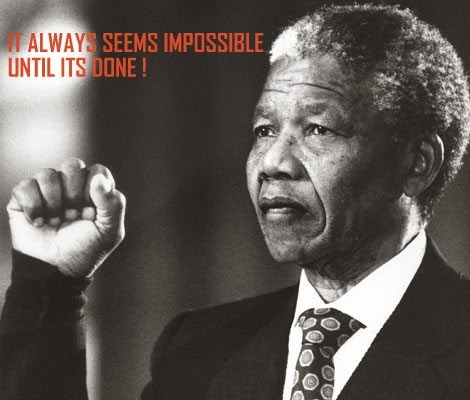 Our thoughts and prayers are with the Mandela family. To them we owe a debt of gratitude," said President Zuma. In an official statement, President Obama said, "I am one of the countless millions who drew inspiration from Nelson Mandela's life. My very first political action, the first thing I ever did that involved an issue or a policy or politics, was a protest against apartheid. I studied his words and his writings. The day that he was released from prison gave me a sense of what human beings can do when they’re guided by their hopes and not by their fears. And like so many around the globe, I cannot fully imagine my own life without the example that Nelson Mandela set, and so long as I live I will do what I can to learn from him." "We will not likely see the likes of Nelson Mandela again," President Obama said. "So it falls to us as best we can to forward the example that he set: to make decisions guided not by hate, but by love; to never discount the difference that one person can make; to strive for a future that is worthy of his sacrifice." 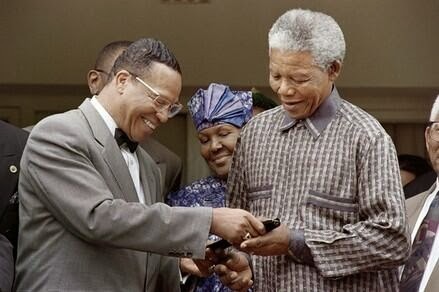 Askia Muhammad, Senior Editor of The Final Call, was apart of Minister Farrakhan's delegation during that 1996 trip and in a column for the Washington Informer, he writes: I remember when Nation of Islam leader, Minister Louis Farrakhan visited Madiba during his World Friendship Tour. Minister Farrakhan was another one of those leaders whom South Africa’s Whites wanted their president to shun. Just the opposite is what happened. In 1996, after the historic Million Man March, President Mandela received Minister Farrakhan and his entourage at his private residence in the Houghton District of Johannesburg, where he received only his most distinguished state visitors. Despite unrelenting pressure on President Mandela to distance himself from his guest, he told reporters following his hourlong meeting with Minister Farrakhan: “There was no issue that arose, on which there was a disagreement. He has explained his position. His views are identical with the principles that I put forward." 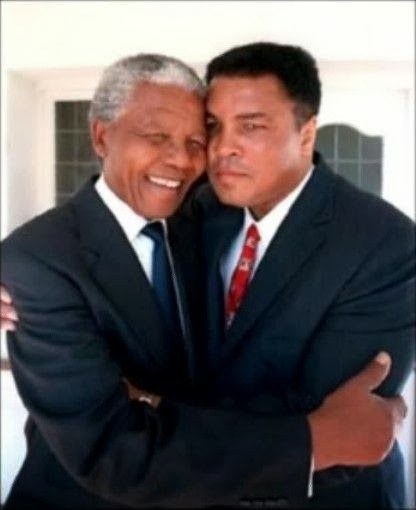 Boxing legend Muhammad Ali released the following statement on his Facebook page: "I am deeply saddened by the passing of Mr. Mandela. His was a life filled with purpose and hope; hope for himself, his country and the world. He inspired others to reach for what appeared to be impossible and moved them to break through the barriers that held them hostage mentally, physically, socially and economically. He made us realize, we are our brother's keeper and that our brothers come in all colors. 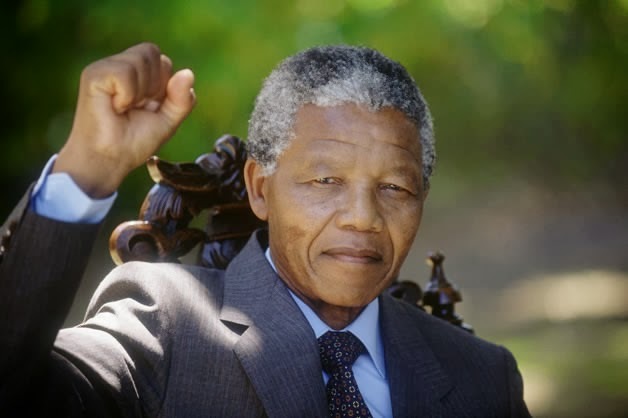 What I will remember most about Mr. Mandela is that he was a man whose heart, soul and spirit could not be contained or restrained by racial and economic injustices, metal bars or the burden of hate and revenge. He taught us forgiveness on a grand scale. His was a spirit born free, destined to soar above the rainbows. Today his spirit is soaring through the heavens. He is now forever free."